The Cuckoo’s Calling is steeped in the atmosphere of London – from the hushed streets of Mayfair to the backstreet pubs of the East End and the bustle of Soho. 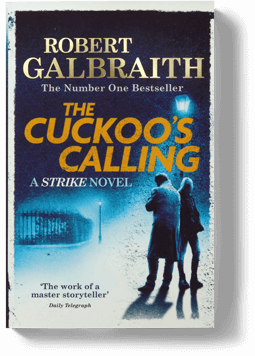 The first book in the Cormoran Strike series, The Cuckoo’s Calling, was published in April 2013 by Sphere/Little, Brown Book Group. It was an international number one bestseller, attracting praise from critics and crime fans alike. Author royalties are donated to The Soldier’s Charity.